Getting a pay raise while sitting on the couch? Sign me up! Thanks Emerson Electric for the dividend increase! On Tuesday of last week the Board of Directors at Emerson Electric (EMR) approved an increase to their quarterly payout. Previously the company had been paying $0.48 per share and now they'll be paying $0.485. I have to say I'm a bit disappointed with just a 1.04% increase. However, Emerson Electric is a Dividend Champion with 60 consecutive years of dividend growth so I'll remain patient and side with their history for higher dividend increases in the future. Shares currently yield 3.15% based on the new annualized payout. Since I own 61.804 shares of Emerson Electric in my FI Portfolio this raise increased my forward 12-month dividends by $1.24. This is the 6th dividend increase I've received from Emerson since initiating a position in 2012. Through organic dividend growth alone Emerson has increased my annual dividend payments over 21% cumulatively. According to US Inflation Calculator the cumulative rate of inflation over that same time is 7.5%. That's dividend growth investing in a nutshell. *Dividend payments prior to 1992 are total annual payments. 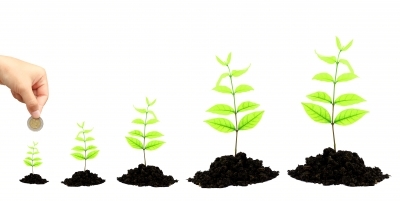 I like to examine the dividend growth rates that a company has doled out over time in order to see whether dividend growth is holding steady, increasing or decreasing. Looking at this gives you an idea as to possible future direction of dividend growth. As an industrial company I would expect Emerson's dividend growth to have a higher variance from year to year compared to say a consumer staple company due to large fluctuations in the operations of the underlying business. Looking at Emerson's dividend history this has played out several times with dividends growing at 10%+ rates for a few years and then sub-4% rates for a few years. So I'm not as concerned about a slowing dividend growth rate from Emerson Electric unless it starts approaching the 5 year mark. My forward dividends increased by $1.24 with me doing nothing. That's right, absolutely nothing to contribute to their operations. Based on my portfolio's current yield of 2.86% this raise is like I invested an extra $44 in capital. Except that I didn't! One of the companies I own just decided to send more cash my way. Thus far in 2017 I've received 43 dividend increases from 36 companies held in my FI Portfolio increasing my forward 12-month dividends by a combined $262.91. My FI Portfolio's forward-12 month dividends increased to $5,866.15. Including my FolioFirst portfolio's forward dividends of $74.67 brings my total taxable accounts dividends to $5,940.82. My Roth IRA's forward 12-month dividends are at $317.73. Do you own shares of Emerson Electric? How forgiving are you of companies that see temporary slow downs in their dividend growth rates? Definitely on the downward trend. Hope to have something more positive in the future, but I will take the 1% bump for now! EMR is just one example of a dividend machine. I remember a few years back when the stock was flat on its face and the yield was approaching 4% and as always everyone was crapping all over the stock like VFC at one time, like MCD, like HRL, like GIS, like GE today. It's a hold in my portfolio and I'd gladly buy more should prices decline. While not a huge increase it still growth and I'll take 1% over 0% or a cut. Thanks for sharing.